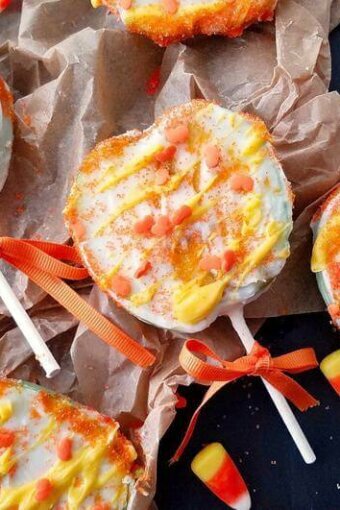 Candy Corn Apple Pops are a quick and easy Halloween treat made with apples, candy melts, and sprinkles. 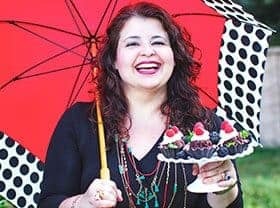 It makes a fun and delicious treat that delights kids and adults. As you can imagine, our treat was inspired by the popular Halloween candy, candy corn. Just like the classic American candy, it has three colors, yellow, orange, and white. 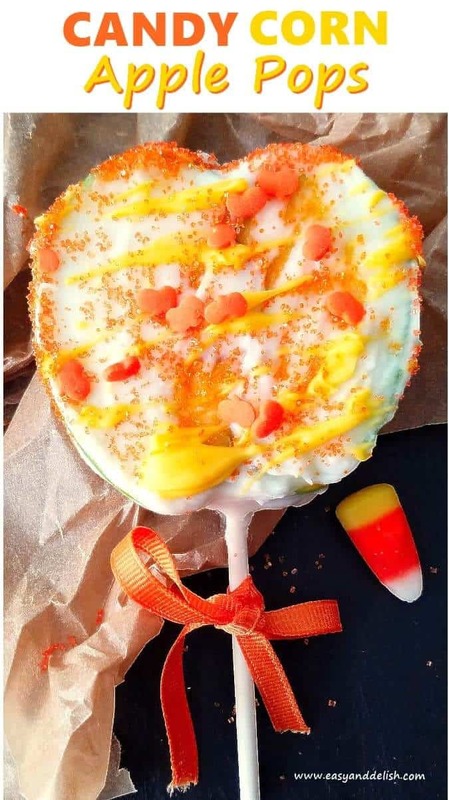 The difference is, our treat is made with sliced Granny Smith apples covered with white candy melts, drizzled with yellow candy melts, and then decorated with orange sprinkles. 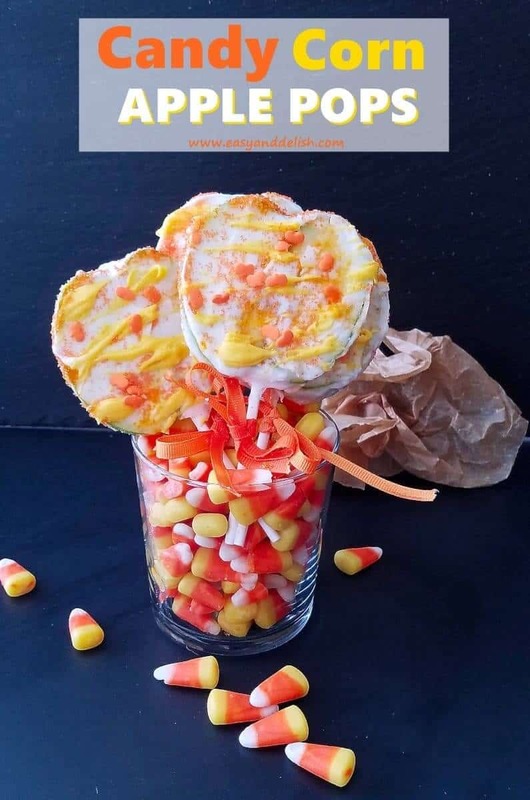 The original candy corn, created in the 19th century, mimics the appearance of corn kernels, hence the name — and it is made with sugar, corn syrup, confectioner’s wax, and artificial coloring. They can be prepared in 30 minutes. 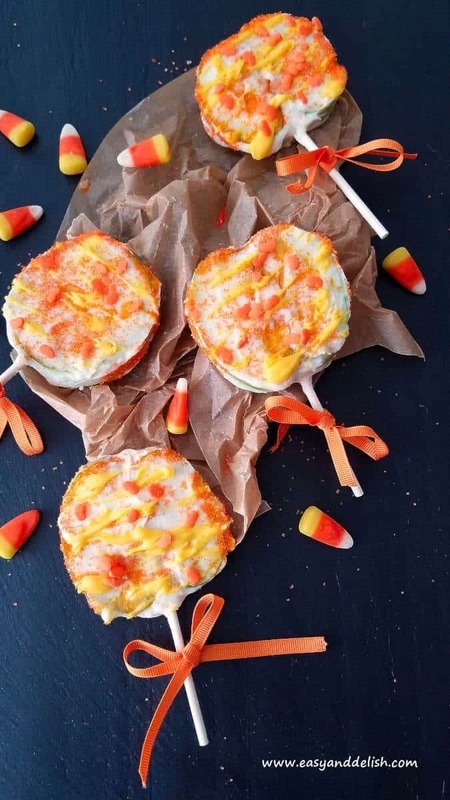 All you have to do is slice apples, stick a candy or popsicle stick in one of the ends, dip sliced apple into the melted white candy melts, and place onto a baking sheet lined with parchment paper to dry. Then, drizzle melted yellow candy melts on top and sprinkle with orange sprinkles. And voila! In the blink of an eye, a treat perfect for your little Halloween monsters will be ready to be happily devoured. Every year my kids dress up in a different costume. This Halloween we will have a witch and a deer. Hehe! How about you? Sit clean apples upright on a wood board and slice from top to bottom (about 4 slices per apple, 1/2-inch thick). Remove seeds gently. Then, line a large cookie sheet with aluminum foil and push the pointed end of each stick up into the bottom of each apple slice. In a medium heatproof glass bowl, melt white candy melts in the microwave according to the package directions, place bowl into a larger pot filled with about 2-inch boiling water (this will help candymelts to not harden), and dip apple slices in melted candy (using a spoon to help coat each slice if your bowl isn't deep enough to cover them). Such cute treats! Looking forward to seeing you in the costumes!!! What a splendid way to enjoy apples! These would make a scrumptious treat for any Halloween party. I wish I had kids to make these for! Mine are all grown up and I miss fun food like this! I’m passing this on to my daughter, I know she and my granddaughter would enjoy making these.